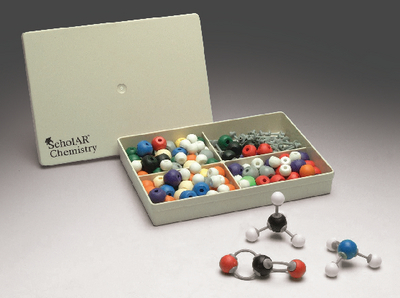 This set features 50 colorful atom parts and 64 links. A tool for easy assembly is also included. Ordering information: This set includes 12 carbon black 22 mm atoms, 20 hydrogen white 15 mm atoms, 6 oxygen red 20 mm atoms, 4 nitrogen blue 22 mm atoms, 1 sulfur yellow 22 mm atoms, 4 halogen green 20 mm atoms, 1 phosphorus purple 22 mm atoms, 1 metal gray 15 mm atoms, 52 medium links, 12 long and flexible links, and 1 tool. Measurements are in diameters.